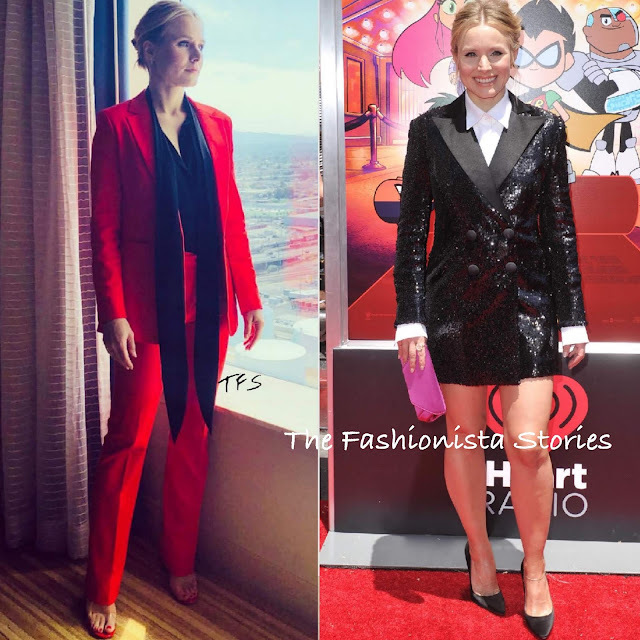 Kristen Bell had a busy weekend as the actress was out promoting the new season of her hit tv show 'The Good Place' at the 2018 San Diego Comic-Con and her new film 'Teen Titans Go! To the Movies'. On Saturday(July 21st) she attended 'The Good Place' press line during the 2018 San Diego Comic-Con at the Hilton Bayfront in San Diego, California. The actress looked great in a ANINE BING red two-piece suit which was teamed with a black NAEEM KHAN blouse. She finished up with an up-do, JENNIFER MEYER jewelry and GIUSEPPE ZANOTTI sandals. On yesterday(July 22nd) she attended the 'Teen Titans Go! To The Movies' at the TCL Chinese Theatre IMAX in Hollywood, California. She sparkled in the OSMAN FALL 2017 'Adele' black sequin blazer dress with a white ADRIANA IGLESIAS shirt underneath. A pop of color came via her fuchsia TYLER ELLIS 'Aimee' clutch which topped off her look along with JENNIFER MEYER jewelry and JIMMY CHOO pumps.